My husband just married a couple this weekend. I always love to see the grooms face when he sees his bride walking down the aisle. My father had left our family about 5 years before I got married. I remember waiting at the back of the church for him to walk me down the aisle. I was his only daughter, but he never showed up. One of my little brothers, who was shorter than me, walked me down the aisle because my older brother was in training to leave for the Vietnam war. Did I care that my dad didn’t come? No!?! I was about to marry the greatest man I had ever met. I was “IN LOVE”!! Almost all brides and grooms are “IN LOVE”, when they get married. One of the main questions wives ask me is, “What can I do to love my husband again?” This is a question that wives ask me all over the world when I give marriage seminars. It is a scientific fact that there is such a thing as “body chemistry.” The sad truth is that it is also a scientific fact that it only lasts about 18 months to 2 years. Thank God he has given us answers in His word on how to handle this. We LIVE by faith, We LOVE by faith. We have heard that love is not a FEELING, but have we learned it??? LET’S LEARN IT!!!!!! This verse tells us to “live love”. We are to love SACRIFICIALLY !! CASE AND POINT: Just like we get up every morning and squeeze the toothpaste out of the tube, we don’t just stare at the tube hoping the paste will come out. I know it sounds ridiculous but lets face it, we put more work into our face in the morning than we do into our marriage all day. God so desires to HELP us SQUEEZE His love into our lives. God will always put people in our lives that for us, are HARD to LOVE. If you don’t find yourself at sometime feeling the squeeze to “walk in love”, WITH PEOPLE WHO ARE HARD TO LOVE, then you might be living a self-centered life. As you step out in faith to love the HARD TO LOVE people in your life, Gods Holy Spirit intervenes and does the impossible. Are you showing love to your spouse, but aren’t seeing any FRUIT from your labor. DO YOU GIVE UP??? Keep going and showing love because you are living out the scripture, “…faith which worketh by love…”. Those verses would not be in the bible if it was just easy to love everyone all the time. It’s impossible for us to do that. * You get nothing in return. God calls all spouses to sacrifice our SELFISHNESS!! AGAPE , which is the Greek word for love, is when you chose to love as an act of the will. We should love out of OBEDIENCE. This doesn’t mean that you will get the results you want. The word “fail“ portrays not having any effect. When you love YOUR SPOUSE sacrificially, EL ROI, the God who sees me, sees everything. Yes!!!! He sees everything!!! When we love our spouse SACRIFICIALLY in Jesus’ name for His honor and glory, WE CANNOT FAIL. Are you going to believe Gods word by faith or are you going to obey your emotions? Love by faith wives, not just by feelings. Why is loving your spouse so painful and fruitless at times? Because you are trying to fill up your gas tank with a little gas can. This verse is saying that He will fill your tank up with His love if you daily make a commitment of your will to Him. DAILY COMMIT YOUR WILL TO GOD!! 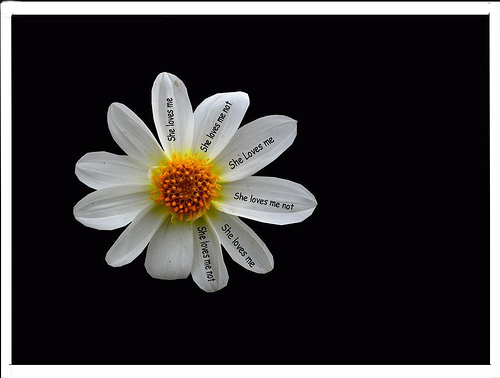 She loves me, she loves me not, SHE LOVES ME !!!!!!!! NOTE: Don’t miss tomorrows post! Every day is a new post.